We are selling these popular necklaces through the wonderful ministry 147MillionOrphans. They buy them and resell them to families who are fundraising to help bring home their child. They're so popular, in fact, that they're sold out on their website right now, so get them here while you can! These would make great Christmas gifts for friends, family, teachers....anyone you can think of! To order, simply click the "Magazine Bead Necklaces for Sale" button on the right side of our blog. You can select your quantity up to 6 (if for some reason, you want to order more than 6, let me know and I'll change the quantity for you!). You can pay with your PayPal account or by debit/credit card. I will ship your necklace(s) directly to the address of your choice. Order now and I'll send them in time for Christmas gifts! 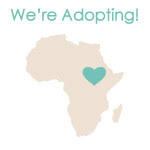 Your purchases go directly into our adoption account and help get us one step closer to bringing our little boy home! Thank you and feel free to message me with any questions! Hello, Wayman Family Nesters! Sorry for my 2 weeks off, but my mind has been a little preoccupied lately (I hope to be able to share with you next week. Sorry for keeping you on pins and needles!). I think these beautiful globes are F-A-B-U-L-O-U-S! I bought some supplies a couple of weeks ago to try my hand at my own version, but I still need to find my own little trees. Michael's only had a bag of assorted sizes for $20 and I was NOT about to pay that! I'll be sure to report back to you when I complete the project! I'm loving this red and white bunting. This is another little project I've got planned for our tree (Which we have yet to buy by the way. But I have grand plans, so don't you worry!)﻿. I'm envisioning this bunting with a burlap tree skirt. What do you think? When I saw this post on the fabulous Emily Clark's blog, I knew this was the perfect solution to display all of our Christmas cards. I have yet to try it out (I really need to get crackin' on all of these projects-I'm definitely behind this year. Eeeek! ), but I'll be sure to show you picture of the finished product! Here's a little DIY snowglobe project﻿. So cute and I bet your kiddies would love it! I saw another one pinned where they put gift cards inside-believe me, it was WAY too cute! What a creative way to spice up giving a gift card! Want a cheap way to glam up your ﻿holiday decor? Go grab a can of sprapaint and some twigs in your back yard and go to town! When they're dry, put them in a vase and voila! Cheap and chic decor! How cute is this untraditional wall tree? I love this unique tree composed of "useless but pretty objects" (according to the creator). Definitely a one-of-a-kind that would be sure to make a statement! So hopefully you're feeling inspired on this happy Friday, my Wayman Family Nesters! I know I am! It's time for me to get going on our Christmas decor. I figure better late than never! What about you, Wayman Family Nesters? Do you have any fun Christmas crafts and decorating going on this weekend?